Millwall have signed AFC Wimbledon striker Tom Elliott on a two-year contract. The 26-year-old will formally join the Championship club on 1 July. Elliott, previously of Stockport and Cambridge United, scored 13 goals for League One side Wimbledon last season. "Tom's a player I've admired for some time now," said Millwall manager Neil Harris. "We've had local allegiances with Wimbledon, so I've been able to watch him a few times." "I'm really pleased to bring him in. 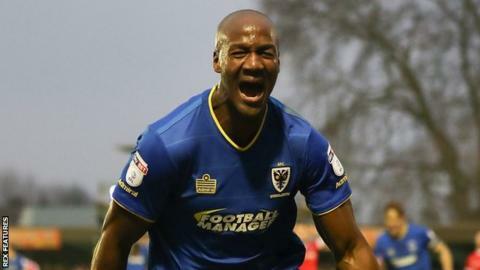 He's a target man who has progressed really well under Neal Ardley over the past two years and has developed into a physical player with a good goalscoring record."